Playing a hometown show can be nerve-wracking when it’s been years since you’ve had a proper hometown show, but the anxiety went away for Kina Grannis as soon as she took the stage. 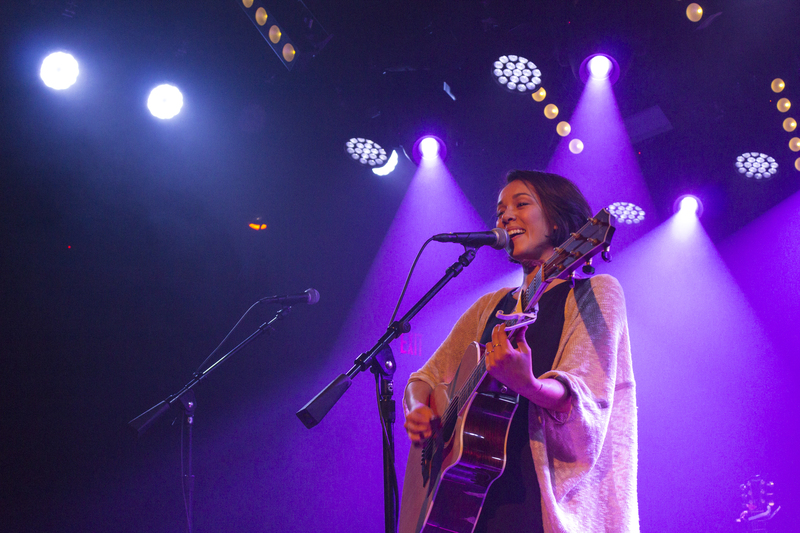 Grannis performed a sold-out hometown show Sunday night at the Teragram Ballroom in Los Angeles, singing songs old, new and some she hasn’t played before a live crowd ever before. Grannis’ bright, cheery acoustics, confessional songs about love, family or being stuck in Jakarta (“100 Days in Jakarta”) were accompanied by moments of crowd sing-alongs and choked-up moments of missing home. In April of this year, Grannis, along with the help of her many friends, followers and Patreon supporters, started her own record label, KGRecords, comprised entirely of her own patrons. Though still a work in progress, under it she has released two songs inspired by her detainment in Jakarta (“California,” “For Now”) and two new ones (“When Will I Learn,” “Beth”). She performed these new songs for the first time Sunday night; and with her many tears, hiccups, self-deprecating humor and an unplugged guitar cable, the crowd was unapologetically gracious as she fumbled through guitar tune-ups and changing chords and cables. “We are all here in this speck of time, sharing this moment together in the grand scheme of our lives,” Grannis said at one point, as she surveyed the crowd. She left the room with all smiles and a sense of warmth still lingering in the crowd. It’s definitely something else when a performer is able to be that intimate, and that inclusive.